What a beautiful cabin and a perfect way to wake up every day. the views from the this cabin are amazing. and the memories made here are treasures we will hold on to forever. Can't wait to come back. Your staff was very pleasant to work with when booking the cabin as well as when we called to ask a question about the internet. I loved the fact that they called us to make sure we had no problems finding the cabin. Everyone we spoke with was very helpful. They called just after check in to make sure all was OK.
Every time I call, the staff is warm and most helpful! They answer questions and are quick to offer assistance or advice. Great group! Everyone was just great. Really appreciated Mike showing us how to work the TV, and someone (sorry I didn't get the name) called the owner to find out where she purchased a chair I loved. I did go to the store she recommended and found and purchased the exact chair. I love it. Thanks. Your team was friendly, helpful and knowledgable. The team made us feel like we did not need to worry about anything should we have a problem as they are available 24/7. Thankfully, we did not have any problems. What a wonderful cabin. Great view! It was great to have some away time together before we had to drop our son off to college. Definitely will plan again for next year. The cabin was everything we had hoped for. The layout was great. The view was spectacular and all the kids wanted to do was get in the hot tub. We had a great time in this beautiful place as we celebrated our 10th Anniversary with a family trip to the mountains. All interactions were straight forward and efficient. Our last minute reservation and exchange of information was as professional as could be expected. We only spoke with someone three times. One was to return call we had received from office to see if we'd arrived. One was to get internet password. And one was to report an electrical outage. All times we were met with friendliness and professionalism and received the help needed..
Our daughter is starting college in the Fall. She wanted to vacation at a cabin. Your cabin is lovely and well equipped. It was wonderful to relax. We loved the views. Thank you for allowing us to stay in your wonderful cabin. It was well appointed and served as our base of operations for our daily excursions. We visited Bryson City, Whittier, Cherokee (a lot), Franklin (a lot), GSMNP (two times) and Gatlinburg. Our favorite activity was gem/mineral mining and visiting the various rock shops. We also saw several waterfalls (Dry Falls, Bridal Veil and 3 falls at Deep Creek. At the end of the day, it was always nice to come back to the cabin. We also enjoyed the nightly firefly lightning bug show starting at dusk. It was a real pleasure to be here and a relaxing break from the "rat race." We hope to be able to return in the future. BEAUTIFUL!!!! Best cabin we have ever stayed in. Relaxing, Furnishing were great. Thanks so much. Thank you for sharing your cabin with us. We have stayed in many cabins and Shooting Star Ridge is by far the most amazing. 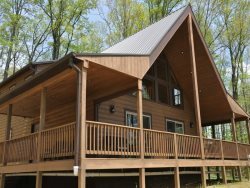 Cabin was clean, well maintained, and attention to detail. The view was "spectacular", hot tub relaxing, fire pit a great bonus fun activity (S'mores) We have never been on a vacation without an agenda but I didn't even want to leave the cabin. Perfect place to celebrate my 41st birthday and my husband and daughter made it perfect with a great grilled steak dinner. We will surely be back in the fall , God willing. Many memories made and such a relaxing time. We didn't work with anyone directly because we didn't need to. The team called us to make sure we found the place and that everything was as we expected.